My Marshall Memorial Fellowship coincided with the final campaign days for the U.S. midterm elections. While in Europe we think of these elections as the ones in which senators and state representatives get chosen, in the U.S. it is much more than that. Dozens of local government positions and local issues get voted on. In fact, a midterm election ballot can contain many questions and list various local positions and topics to be voted on— as these vignettes from Durango, CO show. No election in the US works without the tireless support of thousands of volunteers. Captions under each picture (open in flickr). One of them is Candace Richardson, who hosted me during my homestay in Durango. She owns a beautiful guesthouse and is strongly engaged in local and national politics. 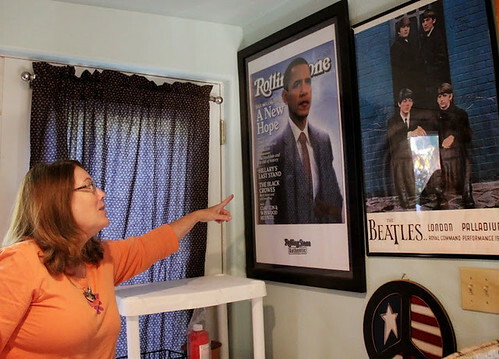 Her two main passions in life: politics and rock & roll, namely the Beatles. She is a strong supporter of the Democrats and Obama and campaigned for him during his two presidential elections. Candace was actively campaigning for the Democrats, but in particular for the candidates for new sheriff and new treasurer. “The only way to reach people is going from door to door and explaining the issues to them”, she says and gets in her car, on which you see advertising for the candidate for treasurer she supports, Allison Morrissey. Issues such as gun control in the US were heatedly debated in the communities I engaged with in Colorado. During my stay Candace invited various friends over to her house to meet me and to have a chat about Europe and the U.S. Gun control was among the topics we discussed, as the views on this are very different than in Europe. Candace is a pacifist and hates guns. The Vietnam War experience was life-changing for her. Her boyfriend at the time was among the last ones to be drafted to go to Vietnam. “I am totally against war”, she says. “The Vietnam war and the murder of John Lennon are among the causes for my political views”. Every 8 December she wears this badge against handguns in remembrance of John Lennon’s death and the violence that guns cause. Among the guests was Sean Smith, who at that time was deputy sheriff. Smith was running against the incumbent sheriff, who had been in that position for 20 years. Candace’s campaigning efforts were fruitful. By the time of election night on 4 November—by which I was in New York concluding my fellowship—Candace sent me great news: Durango has a new sheriff! Sean and Allison won the elections. Both candidates could not have made it without the tireless support of people like Candace, engaged citizens that go door to door and speak to people. This is a key lesson I learned from the Marshall Memorial Fellowship: the importance of grassroots engagement in politics. I have long admired this kind of grassroots campaigning, which would benefit Europeans, especially for European elections. And although I very much doubt that people in Europe would open their doors to strangers to talk about politics in the way Candace did, I take with me back to Europe some of her passion and conviction as inspiration. Gabriela Keseberg Dávalos, Foreign Policy Advisor to the Vice-President of the European Parliament, is a Fall 2014 Marshall Memorial Fellow. Flickr album published at gmfus.org (German Marshall Fund of the United States).